The €-5032 calculator combines the usual printing desktop calculator functions of a TI-5032 SVC with an Euro currency conversion. The exchange rate between the Euro and the Home currency is entered with the SET-key. Two additional keys allow the conversion in both directions. From a technical point of view is the €-5032 a clean and simple construction based on the Toshiba TC-83230 single-chip printing calculator circuit. It is connected directly with the printer-mechanism, the LC-Display and the keyboard contacts. 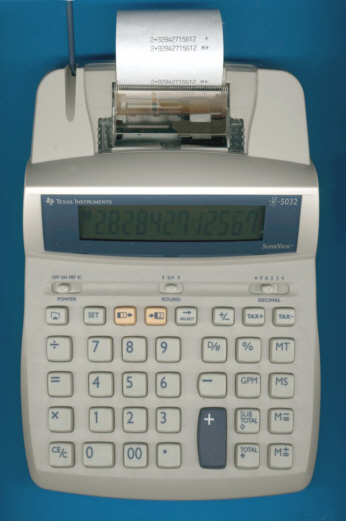 Non-printing desktop calculators with Euro conversion were introduced with the €-1796, €-2002+ and €-2003, mid-size and high-end printing calculators with the €-2004, €-2005 and €-2006.